Don’t you just love the beauty of patterns? With so many to pick from (stripes, checker, damask, palmette, etc. ), we are definitely spoiled for choice when it comes to adding interest and detail to just about any space imaginable. 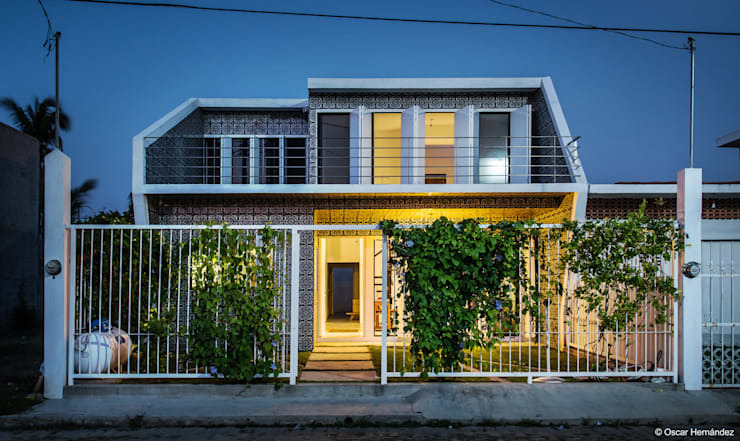 The architects of today’s house here on homify 360° seemingly agreed, for they decided to flaunt a strong batch of patterned tiles on the house’s front façade – from the ground up all the way to the first-storey roof. In addition, this house also treats us to a super contemporary look with a linear design, earthy neutrals, and sleek surfaces for select furniture- and décor pieces. 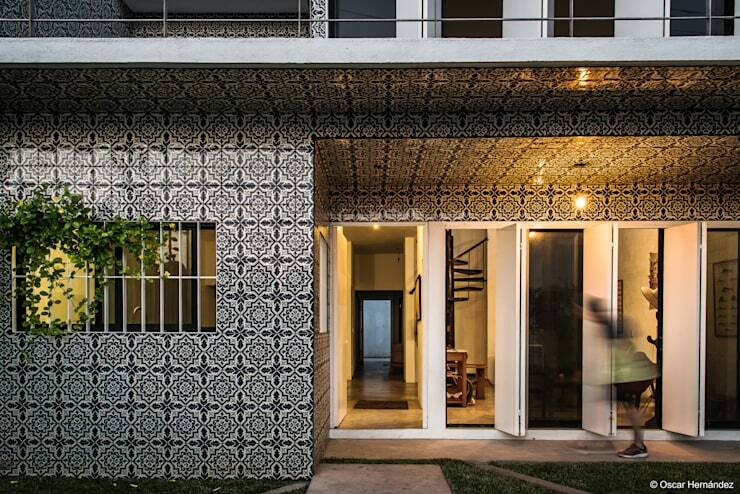 Even though the patterned tile is the main feature of the front façade (in our books, at least), that golden glow streaming forth from the house also deserves a special mention. Just see how exquisitely it lights up the interiors, spills out onto the terrace, and even reaches the front fence. Now, back to the architectural structure – let’s take a closer look. We all know how timeless the monochrome look is. Many designers have crowned the black-and-white combination as the king and queen of colour contrast – and we definitely agree with them. 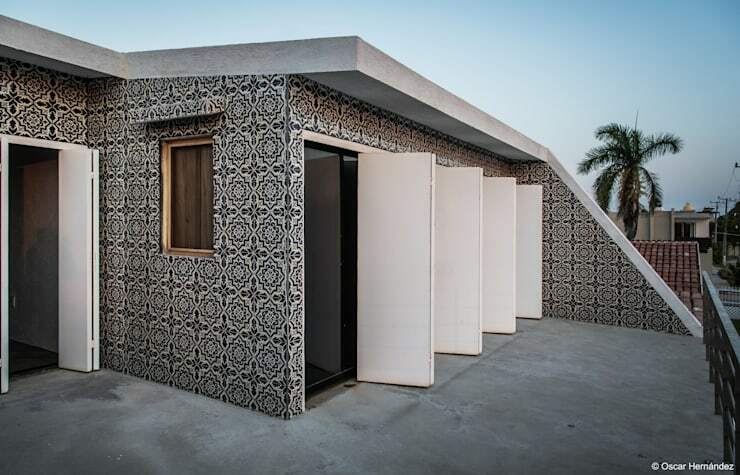 Look at how fantastic the dark and white tones of the patterned tiles grab our attention while also adding so much interest and character to the exterior façade. Now this is how you welcome guests to your front door in style! 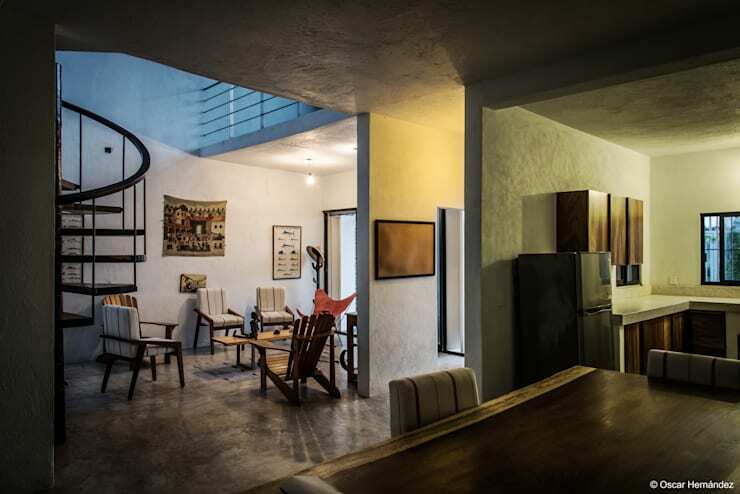 The interiors seem to flaunt a unique space that is slightly open-plan while also neatly separating the different rooms. 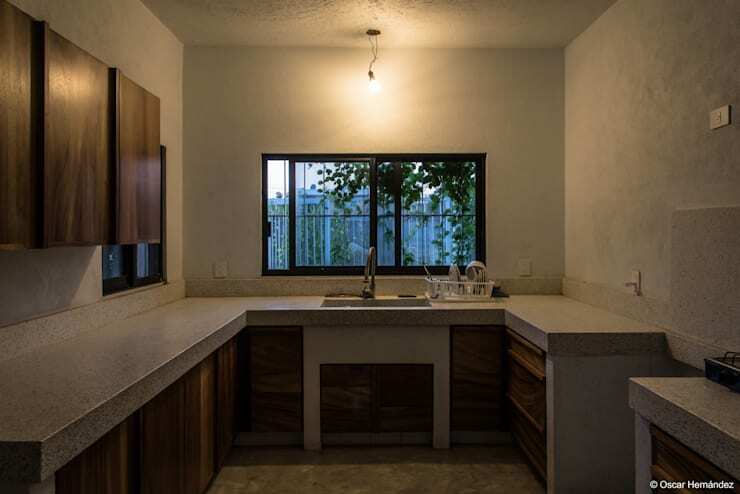 One can clearly distinguish, for example, between the dining room and living area. However, those magnificent neutral colours are what bind the rooms together, elegantly flowing from floor to ceiling while adorning the surfaces from corner to corner. The light neutrals continue into the kitchen, which flaunts a very clean and sober look. No fancy frills, no overly embellished surfaces to speak of – don’t you just love the minimalist style? Notice how effectively the family room combines different textured (and coloured) materials, from rustic wood to raw concrete all the way to sleek metal and crystal-clear glass. 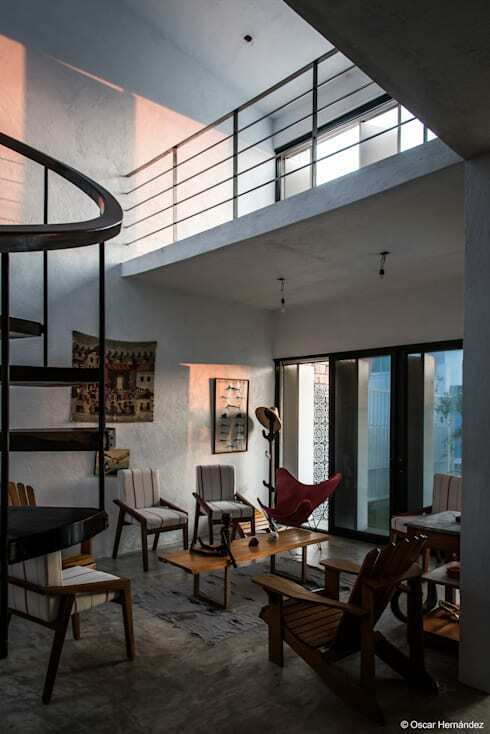 Although the patterned tiles from the exterior façade can be glimpsed through the window, this interior space isn’t left high and dry motif-wise – check out the wall art presenting some delicious patterns of their own, as well as certain chairs flaunting some neat striped fabric. 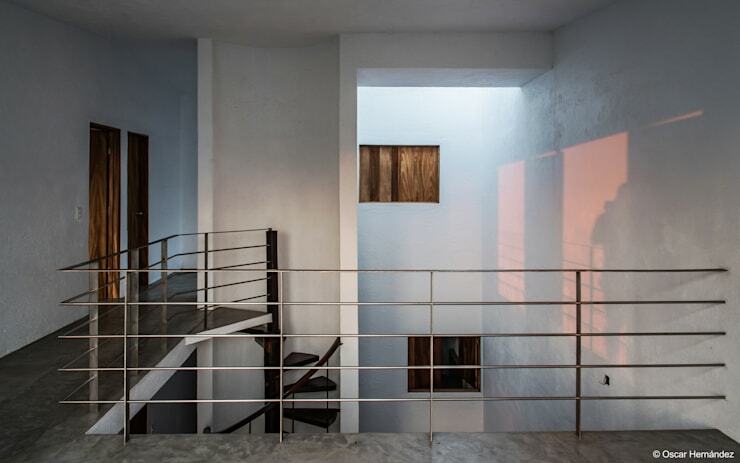 The spiral staircase elegantly flows upwards, where an open balcony allows us to look down onto the floor below. And thanks to the clean walls and the fact that almost not décor pieces have been used, this upstairs space just looks so open and airy. Time for one last look, and we chose the delightful balcony outside, where the patterned tiles continue to flaunt their detailed look. Notice the white folding doors that play perfectly along with the monochrome colour palette. What furniture pieces would you add to this space? A potted plant? Perhaps a café-style table with two chairs? Or is it perfect as is? Want to see more residential beauties? Feast your eyes on: The beautiful home filled with secrets and ideas to copy. We love it, but can’t speak for everyone. Tell us what you think of this house.